Today's giveaway is from Aura, a Melbourne-based homewares company - headed by the talented, tireless and always exuberant Tracie Ellis - which now exports all over the world. It's always fun to see the collections that she puts together. I remember when I first saw this design, I was so excited that a style long popular in magazines like Domino was finally available in Australia. 1 x Cross quilt cover (pictured above) and a set of standard pillowcases, valued from about $228.95 (depending on your bed size). For a chance to win, visit Aura's online shop and leave a comment below. A winner will be chosen at random after comments close at midnight on Wednesday 19 January. Don't forget to check back to see if your name was selected. I will need you to contact me with your delivery address details. Congratulations! Contact me with your delivery address details and a daytime phone number and we'll organise delivery of your prize. Oo! My room would love something new! Thank you for introducing me to Aura - this giveaway would enable a much needed makeover of our master bedroom. So many beautiful things...ahh Aura is now saved to favourites! love aura. hello manchester, my old friend. What a gorgeous cover set! Would look fantastic in my beachy/ french provincial bedroom. New bed linen from Aura - what a treat!!! My fingers rare crossed!! What an amazing giveaway! I love her shop! wow - i love those colours! so very calming! so beautiful ... I do hope it's me! Love the shop! Especially the red chevron quilt! So pretty! Loving the Tie Dye Silk Scarf Taupe! Everything looks so comfy! wow... gorgeous ensemble!! what a lovely gift to some lucky bedroom..
thanks so much and PICK ME!! This would be perfect for my new apartment! Gorgeous bedding! It would go so well in my newly painted room. I want to live in this shop. Online of physical, I don't mind. Beau-t-iful products! Love! I have loved Aura for years! and have many pieces at home. Their designs really appeal to me... would absolutely LOVE a new set to put in our very recently renovated 3rd bedroom...it's painted all one colour and dying for some personality! Their range is beautiful! I love the tones and textures used. Thankyou Aura! I have been hunting for the perfect bed linen for a shoot next week and luckily Daily Imprint has brought my attention to you! I would love to have you in my home! Wow! I love Aura! My bedroom really could use a new look! Thanks for the chance. Aura has so many great things! From beautiful dining accessories to the gorgeous bed linen. Too many wonderful things to choose from! Am loving Tracie Ellis' designs for Aura. OOoooo! Pick me! My room would smile from door to door. x Jen. Oh my goodness. This is *exactly* what I'm looking for at at the moment. A new quilt cover just like this has totally been on my mind!!! Love it, love it, love it. Thank you very much for the opportunity to throw my hat in the ring on this one! Fingers crossed! that is absolutely beautiful! would feel like sleeping on clouds! Aura is just gorgeous so many beautiful things. Whilst I'd love to makeover my bedroom if I won this giveaway I would give it someone who has just lost everything in the terrible floods that have caused so much devastation in my home state so at least when they are back in their home and can retreat to their bedroom (and it may just be a blow up bed for a while)at least it would look pretty for them. Gorgeous, Gorgeous Gorgeous, Thank you for this chance to win! Thank you for the opportunity to be so stylish!! After recently coming home after a long days work to find my ageing cat had decided it was easier to go to the bathroom where she was sleeping (gross, i know!) I am definitely in need of thes fab sheets! What a stunning prize! Aura has beautiful things. Thanks for the giveaway. My last doona set I bought in Paris 5 years ago and lugged them (king size) all the way home. Have been searching for something as beautiful and think I may now have found. Thanks. So lovely! And they have a great sale on now too :o)Thanks for bringing the opportunity to own this lovely linen to us all. Just what we need in our dull bedroom! Love it. Just in the colours I am looking for.....new bed and mattress just ordered this afternoon, this would certainly finish off my room! PS cant wait to sleep on my new mattress!!! Beautiful - have subscribed to Aura e-news letter already. Fabulous Giveaway Natalie! With my maternity leave lingering to an end so are the last few dollars in the old bank account - how lovely to get some thing new without having to explain your life away to the husband! Congrats on the move to the Mac from PC - am thinking about making that move later in the year.. will be keen to hear how you go - can empathise on the PC hot keys hugely! Thanks for a great blog! Thanks for dangling a carrot in front of my eyes to visit this gorgeous website, Aura by Tracie Ellis. As an interior designer I will no doubt recommend shopping here. Love it! After four years of juggling family, work and study I've finally finished my undergrad degree and have decided to take a years break. This year will be my year of family and the home which has been sadly neglected of late. My daily dose of imprint is giving me great inspiration for living and decorating and I'm already imaging the beautiful products I saw on the Aura website in my home. Hi Natalie, I'm a journal girl so I love the Rumba Peacock Notebook, what a great website they have. I just had a look at the aura website. Their are so many lovely things.I always play it safe with white bed linen so it would be good to step out of my comfort zone! Last year was extremely tough for my best friend, who is now, a single mother. I would love to help her get a good night's rest with a some 600TC Sheet Sets in Pearl. Gorgeous pieces and a gorgeous website! Beautiful Products, presented and photographed in an engaging way. Along with an easy to use website. ah! just fallen in love with their Ena napkin range too! What an awesome giveaway! oh wow!!! how lovely. such a GREAT giveaway! thanks so much! i REALLY want this quilt!! so perfect for my apartment!! lovely shop! wow this is wonderful! perfect for my room at school!! Oh my, how much would I love to have that amazing Amazon Fur Throw on her website! It looks so soft and warm and snugly! What a great giveaway...thanks! I am updating my bedroom and would love to have this setting - it would top it off perfectly! Love the shop by colour feature.. those purples are intoxicating. In love with Tyra in Cashmere Rose...mmmmm. Awww...love the Aura collection! And, love to win! Great site! 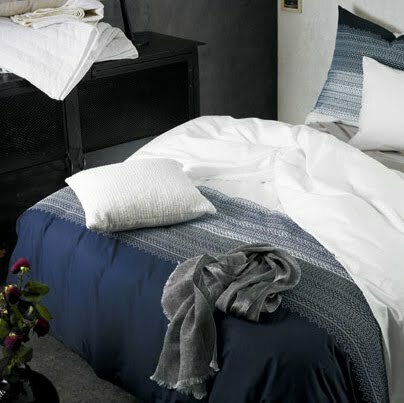 Beautiful bed linen and LOVE the ribbed throw and Rumba notebooks! My first 'adult buy' was an Aura quilt set about 8 years ago, it's still my fave. What stunning bed linen. I love that Aura allows us to make our bedrooms a beautiful haven and a cosy sanctuary. I've just bought my first home...yay finally...and it would be utterly fab to win this! Super gorgeous wares...The placemats have ben on my wishlist for a while now...fingers crossed! Love it, its both feminine and masculine at the same time, perfect!